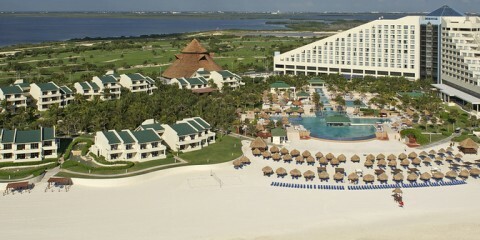 The Iberostar Cancun is a luxurious 5 star family friendly All-Inclusive complex that is situated on one of the best beaches in Cancun, Mexico and is just 15 minutes from the Cancun international airport. The Iberostar Cancún Hotel features 426 guestrooms of which 224 are Superior Rooms with sea view, 99 Luxury Rooms with balcony and sea view, 28 Beachfront Villas with balcony, 54 garden view Villas, 16 Junior Suites, 4 Master Suites, and 1 Presidential Suites. All of our rooms are carefully decorated with the finest details in classic Caribbean Mexican fashion. Guests of the Iberostar Cancun Hotel will enjoy an unforgettable dining experience in Cancun. This 5-star hotel features two buffets and four a la carte restaurants specializing in global cuisine: gourmet, Japanese, Mexican, and so much more.